TV's morning sunshine is officially back! 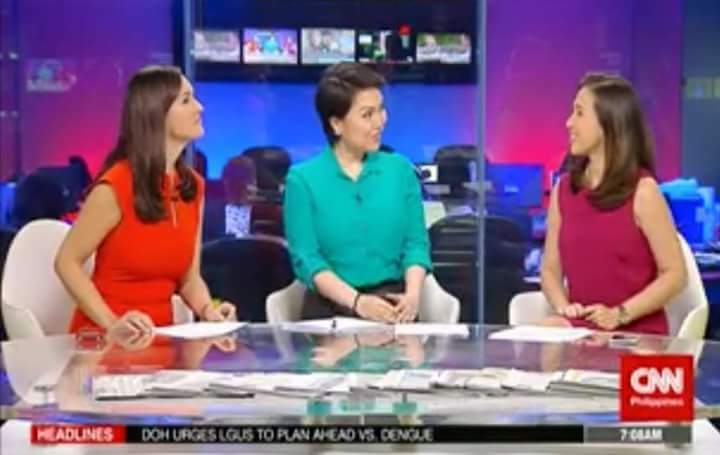 Claire Celdran made a surprising return to CNN Philippines this morning, almost a year after leaving the network, which was then known as 9TV. Celdran was officially reintroduced to the viewers of Channel 9 as the new co-anchor of Headline News, joining her old Daybreak partner Amelyn Veloso and Claudine Trillo. Before signing a new deal with CNN Philippines, Celdran, like Nancy Irlanda, was also in talks with Bloomberg TV Philippines according to our network sources. Celdran was a familiar fixture in morning television after serving more than a year as co-anchor of the then-highly praised Solar Daybreak. She was also the anchor of Solar News Updates and some of the network's special broadcasts before leaving in September of last year. Interesting to note that Celdran made her TV comeback just a day after her former ANC/Solar News colleague Nancy Irlanda made her debut on Mornings@ANC. @MediaNewserPhil so totoo ba ang napapanood ko si Claire Celdran ay nasa CNNPH Headline News? i had to tweet. @ClaireCeldran is back on @cnnphilippines via Headline News! Kala q nagreplay ng 'daybreak'. Tinignan ko talaga yung screen.